If you are competing in MSA governed events within the U.K. you may (or may not!) already be aware of FHR or HANS Devices. These life saving devices are becoming more popular. 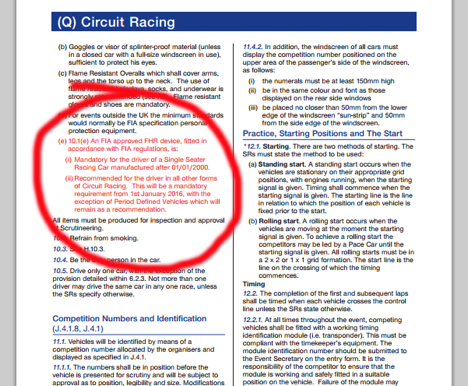 In the 2015 MSA ‘Blue Book’, competitors driving Single Seater racing cars manufactured after 1st January 2000 must use an FHR device, and it’s recommended in all other forms of circuit racing. FHR or HANS Devices will be mandatory for all circuit driving from 1st January 2016, with the exception of Period Defined Vehicles which will remain as a recommendation. Mandatory use of FHR’s / HANS will also apply in Stage Rallying and Hill Climb & Sprints from 2016. SO WHY SHOULD YOU WEAR ONE? Normally referred to as a HANS Device (HANS standing for Head And Neck Support) but now more commonly known as an FHR (Frontal Head Restraint), these FHR systems when fitted correctly, can prevent serious injury. If you imagine having a frontal impact, your harness stops your body from moving forwards, but without an FHR system fitted, your head will continue to move forward, at an accelerated rate due to the extra weight of your head as you will be wearing a helmet. This force on your neck of moving forward and then suddenly ‘snapping’ back can result in serious Basilar skull fractures which can cause paralysis and in some cases, can even be fatal. The FHR system slows this sudden movement down and also minimises how far forward the head travels during impact. SO WHICH FHR DEVICE DO YOU NEED? Here at Merlin, we stock a wide variety of FHR Devices to try and cater for all competitors in all forms of Motorsport. The two main criteria for HANS Device selection is firstly neck size, and then what driving position you have. NECK SIZE – Most FHR Systems are available in two sizes. Medium is for neck sizes 15” to 18” (38-46cms approximately). Large size is for neck size 18” (46ms) upwards. FHR Devices are available in differing reclines. This enables you to get a comfortable fit whilst in the driving position. We would always recommend you to come and visit us at Castle Combe Circuit to try a few on. 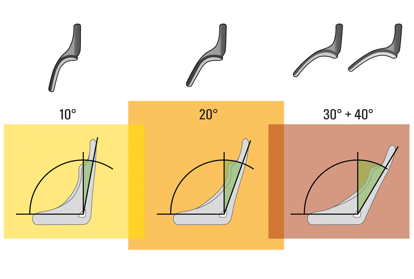 But obviously this is not always possible, so here is a guide to the two most popular FHR Device degrees of recline. The 20 Degree FHR system is the most popular type of recline. This angle suits the majority of competitors driving saloon cars, some sports cars and some historic cars. Due to this angle being so popular, the options on the models available in this recline are wide. The Stand 21 Racing Series 2 FHR Device is a mix of Plastic and Carbon which is injection moulded at extremely high pressure making it strong and relatively light weight. The XLarge size option on this device is a very generous fit, ideal for the bigger driver. Stand 21 also offer two fully Carbon Fibre constructed FHR Devices, the Hi-Tec and Ultimate models, which are extremely light weight for optimum comfort and fit. Whilst Schroth off their XLT FHR Device which is also manufactured from Carbon Fibre and weighs just 460grms, making it one of the lightest FHR Devices on the market today. All three of these FHR systems are available as 20 Degree versions. This angle primarily suits single seater drivers who are led down more when compared to a ‘bucket’ type seat. The shallower angle gives improved comfort in the driving position and is also sometimes used in Sports and GT Prototype cars. The afore mentioned Stand 21 Hi-Tec and Ultimate models and the Schroth lightweight XLT FHR devices are also available as 30 degree versions. If you are still unsure of which degree of recline you require. Or likewise, if you are lucky enough to compete in more than one type of vehicle with varying seat positions, we now stock the hans™ Adjustable Rake FHR Device. A relatively new design in FHR Technology, the hans™ is available in two sizes to cover all driver sizes and has the unique function of adjustable rake, meaning it covers all seat reclines from 10° to 40° in 5° increments. Weighing just 970grms and fully FIA Approved, the hans™ Adjustable FHR Device can easily be adjusted (using the two tools supplied) in a matter of minutes.